Windows 8 Shutdown Controler is a free app that lets you to access the power options for your Windows 8 device from the desktop. The standard way to access the power options in Windows 8 and 8.1 is quite cumbersome- first you have to reveal the charms bar, then access settings, then click on power, and then select your desired option. Many people complained of this but Microsoft turned a deaf ear to these complaints, and here came the opportunity for developers that they couldn’t miss. CodePlex has released an app that addresses this issue- the name of the app is Windows 8 Shutdown Controler. Let’s see what this app actually does. Head over to the download link provided at the end of this post, and click it. That’s all, you will now have the .exe file downloaded on your system. You won’t believe the simplicity of this app. The app is extremely simple to use. Double click on the .exe file that you have just downloaded. You will be presented with a screen that looks like the below screenshot. Now, you will be presented with the main interface of the app. 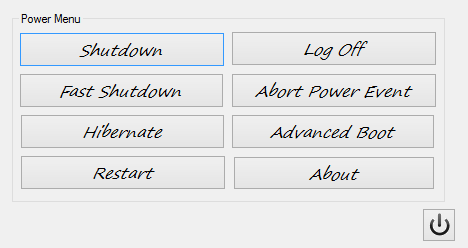 Just choose the option that you wish to select- Shutdown, Log Off, Fast Shutdown, etc. 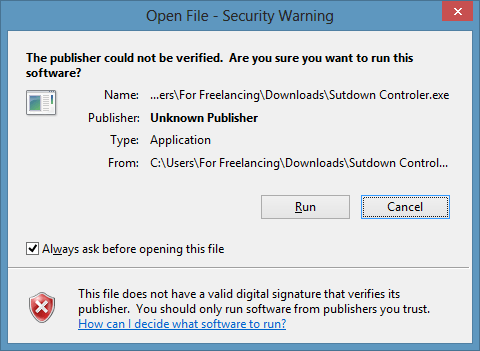 If you wish to close this dialog, click on the power button at the bottom right corner of this dialog. I’d highly recommend not using the Abort Power Event and Advanced Boot options unless you know what you are doing. Well, that pretty much winds up the how-to on using this applet. You can place this exe file on your desktop and double click it whenever you need to shutdown or logoff – it’s much faster than the traditional method in Windows 8 anyway. The advantages are pretty obvious. Here are a few just for the sake of naming them. The time taken for performing an action like shutdown or logoff is reduced considerably. It offers more options than the standard Windows 8 power menu. Below you can see a screenshot of the power options offered by the Windows 8 power menu. It doesn’t run in the background and hence does not drain the battery. 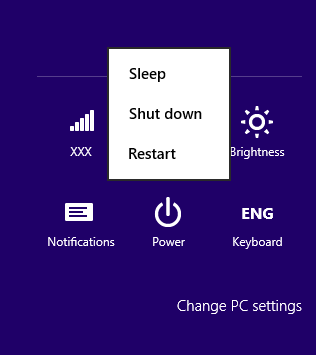 Also check how to add a Shutdown button to Windows 8 Start Screen. Windows 8 Shutdown Controler is a great app to have on your Windows 8 device if you are tired of the traditional way of accessing the options to shutdown, sleep etc., in your Windows 8 machine. You should definitely give this app a try! Get Windows 8 Shutdown Controler here.